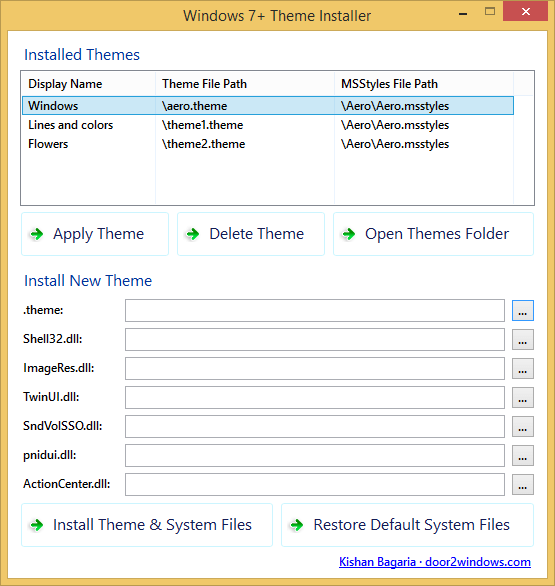 Windows 7+ Theme Installer is a freeware from door2windows which lets you easily install new 3rd party Windows themes, apply & delete existing themes. Run the app. On the first run, it will ask if you want to patch the UXTheme files. Patching is required if you want to use 3rd party themes. If you haven't already patched the files (or if you are not sure), click Yes. After some time Windows will automatically log off indicating the patching has been done. Login and run the app again. 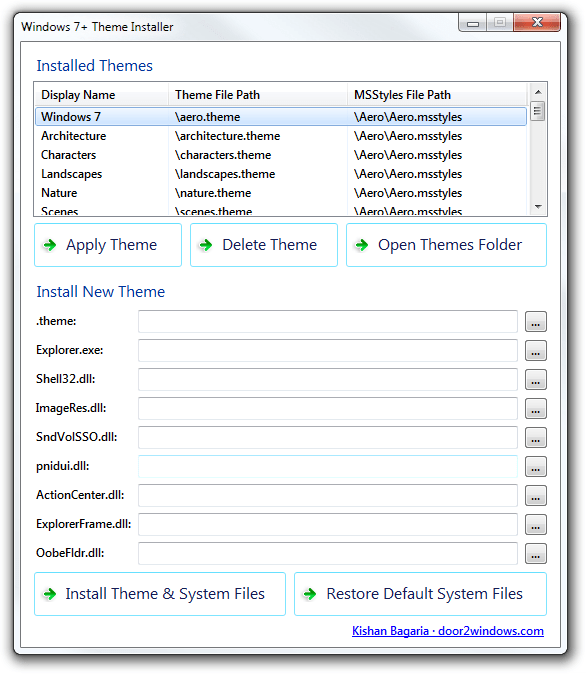 Click the … button after .theme and browse for the theme file. 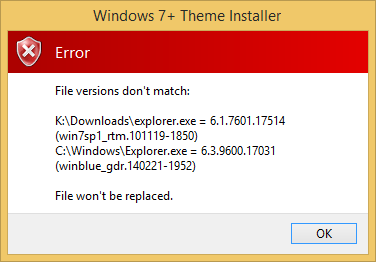 After you have selected the .theme file and the system files that you want to replace, click Install Theme & System Files. 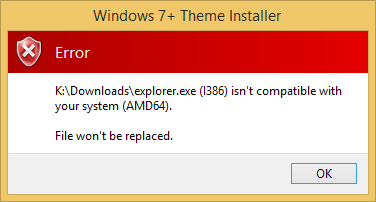 Windows Explorer will automatically restart and the theme and system files will be installed. Select the new theme in the list and click Apply Theme to apply the theme. To restore the default system files just click Restore Default System Files. 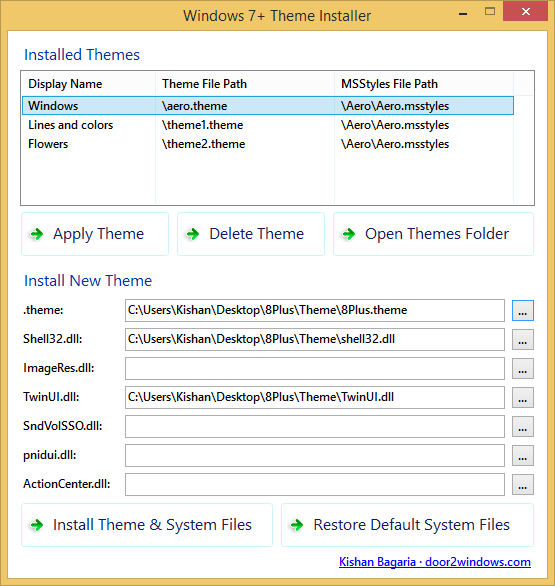 To apply/delete existing themes, select any theme in the Installed Themes list and click Apply Theme/Delete Theme. 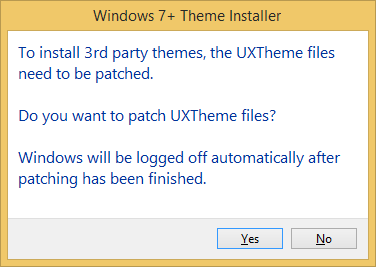 Credit goes to Manuel Hoefs for the UXTheme patcher.